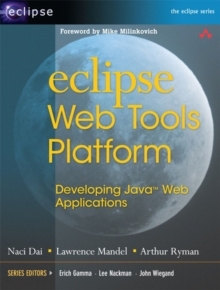 Discover WTP, the New End-to-End Toolset for Java-Based Web Development The Eclipse Web Tools Platform (WTP) seamlessly integrates all the tools today's Java Web developer needs. WTP is both an unprecedented Open Source resource for working developers and a powerful foundation for state-of-the-art commercial products. Eclipse Web Tools Platform offers in-depth descriptions of every tool included in WTP, introducing powerful capabilities never before available in Eclipse. The authors cover the entire Web development process-from defining Web application architectures and development processes through testing and beyond. And if you're seeking to extend WTP, this book provides an introduction to the platform's rich APIs. The book alsoPresents step-by-step coverage of developing persistence, business logic, and presentation tiers with WTP and Java Introduces best practices for multiple styles of Web and Java EE development Demonstrates JDBC database access and configuration Shows how to configure application servers for use with WTP Walks through creating Web service application interfaces Covers automated testing with JUnit and Cactus, and automated builds utilizing Ant, Maven, and CruiseControl Introduces testing and profiling Web applications with the Eclipse Test and Performance Tools Platform (TPTP) project Describes how to extend WTP with new servers, file types, and WSDL extensionsForeword Preface Acknowledgments About the Authors Part I: Getting Started Chapter 1: Introduction Chapter 2: About the Eclipse Web Tools Platform Project Chapter 3: Quick Tour Chapter 4: Setting Up Your Workspace Part II: Java Web Application Development Chapter 5: Web Application Architecture and Design Chapter 6: Organizing Your Development Project Chapter 7: The Presentation Tier Chapter 8: The Business Logic Tier Chapter 9: The Persistence Tier Chapter 10: Web Services Chapter 11: Testing Part III: Extending WTP Chapter 12: Adding New Servers Chapter 13: Supporting New File Types Chapter 14: Creating WSDL ExtensionsChapter 15: Customizing Resource Resolution Part IV: Products and Plans Chapter 16: Other Web Tools Based on Eclipse Chapter 17: The Road Ahead Glossary References Index This book is an invaluable resource for every Eclipse and enterprise Java Web developer: both those who use Eclipse to build other Web applications, and those who build Eclipse technologies into their own products. Complete source code examples are available at www.eclipsewtp.org.